The codling moth was accidentally introduced into British Columbia from Europe in the early 1900s. Soon after its arrival, the moth began to inflict extensive damage in apple and pear orchards. For many decades, fruit growers struggled to contain the moth and the damage it caused. Chemical pesticides of various varieties were used in increasing quantities to slow the insect’s spread and minimize crop loss. The moth’s ability to build resistance to even the most toxic pesticides, however, limited the effectiveness of chemical-based management strategies. Concerns over unacceptably high rates of codling moth damage, coupled with a desire to significantly reduce the use of chemical pesticides, prompted fruit growers, local governments, and scientists to search for a new approach to codling moth management that was effective, affordable, and environmentally friendly. They turned to sterile insect technology (SIT). SIT was developed in the 1930s and first applied to control screw worm pests in 1953. Described as “birth control for insects”, the technology works by pairing sterile male insects with wild female insects so that the females are unable to produce viable offspring. Thirty years of work by scientists at the Pacific Agri-Food Research Centre in Summerland confirmed that the technology was well suited to address the codling moth issue in the fruit growing areas of the Southern Interior. The SIR Program was initiated in 1992 in the South Okanagan. 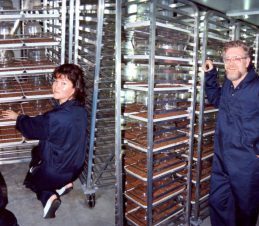 The $7.4 million insect rearing facility in Osoyoos, BC, was completed in 1993. The release of sterile codling moths began in 1994 in the South Okanagan, and in the central and north Okanagan in 2002.